GKE has been an up-to-date, robust, and reliable Kubernetes distribution for as long as we’ve been using it, which is not too surprising as Google is the birthplace of Kubernetes. We’re looking forward to seeing lots of new deployments running there and giving our customers even more choice in where to run their Platform-as-a-Service. Google Cloud isn’t the only Kubernetes platform our customers are asking about. Several have asked us if we will support a “bring your own Kubernetes” model for their DIY or third-party Kubernetes implementations. We’re working on policies for that as well. 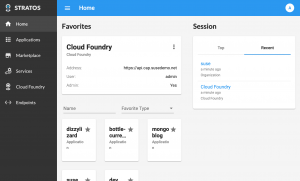 Included in version 1.4 will be a technology preview of Eirini, the Cloud Foundry Incubator project that is transforming how user applications are scheduled in Cloud Foundry Application Runtime. Eirini fits beautifully with SUSE’s vision of tightly integrated Kubernetes and Cloud Foundry. Operators installing Cloud Application Platform will have the choice to deploy their cluster with either Diego, the container scheduler developed specifically for Cloud Foundry, or setting up Kubernetes-native application scheduling with Eirini. Developers pushing applications will notice no difference, as the end user workflow and CF API are exactly the same. Though Eirini has made huge progress over the past year, it’s not quite at feature parity with Diego yet. Still, it’s important for us to get this technology out there so it can get some battle testing in the field. With some real-world application instance hours under its belt, we think Eirini will show the Cloud Foundry community just how powerful Kubernetes can be, and show the Kubernetes community just how much easier creating deployments can be. Since SUSE brought the Stratos web interface into the Cloud Foundry Incubator, lots of great feedback and suggestions have come in from the community. A couple of these will be making it into the 1.4 release: a User Provided Service interface for saving service connection data, and a customizable Home screen to give quick access to the applications, orgs, spaces, and endpoints you use the most. SUSE Cloud Application Platform 1.4 is scheduled for release at the end of April. This will be a straightforward ‘helm upgrade’ for existing users and a simple ‘helm install’ for new ones. We hope you like what you see.